Tomorrow marks the 150th birth anniversary of one of Lanka’s greatest sons’, Sir Don Baron Jayatilaka, (Sir D.B). He was a true son of the soil, born on February 13, 1868, in a remote village in Waragoda, Kelaniya. He was the eldest son of Don Daniel Jayatilaka and Dona Elisa Jayatilaka, a highly respected noble Buddhist family in Kelaniya. His primary education at the Vidyalankara Pirivena, inculcated in him true Buddhist values, under the tutelage of scholarly monks, where he learnt Sinhalese, Pali, Sanskrit and Buddhist literature. His secondary education was continued at Wesley College, an excellent missionary school, where he was exposed to the western curriculum. The natural scholar and intellect he was, led him to obtain his BA with Honours from the University of Calcutta, in English and Latin and later on he went on to obtain his MA from the University of Oxford. He was called to the Bar at Lincoln’s Inn, and subsequently enrolled as an Advocate of the Supreme Court of Ceylon. In 1898 he married one Mallika Batuwanthudawa from Warahena Bentota. The young Sir D.B returned from England at a time when the country was seeing the revival of its religious, cultural and national values, which was in a state of decrepit due to colonial rule. He too being passionate for this cause came under the influence of prominent persons such as Henry Steel Olcott, Anagarika Dharmapala, Sir Ponnambalam Arunachalam, D.S. Senanayake, C.W.W. Kannangara, S.W.R.D. Bandaranaike, T.B Jayah and the like. The Buddhist renaissance which began in the early eighties of the 19th century and gained greater momentum in the early years of the 20th century was orchestrated by Henry Steel Olcott, Anagarika Dharmapala, together with Sir D.B. This was also a time when Henry Steel Olcott started the Buddhist Theosophical Society which began to open Buddhist schools in various parts of the country to promote Buddhist education and Sir. D.B played an active part of this movement. This was during a time and era when education was a monopoly of the catholic missionary institution. Together they started Dharmaraja College in Kandy where Sir D.B became its first principal in 1890. His motive was to serve the Buddhist who had no English schools of their own. It is said that he went round neigbouring villages to raise funds for Dharmaraja College and became a household name even in the remotest villages of the province. Within a short period of time, with his ardent dedication and hard work he was able to transform Dharmaraja College to a leading school in the province. 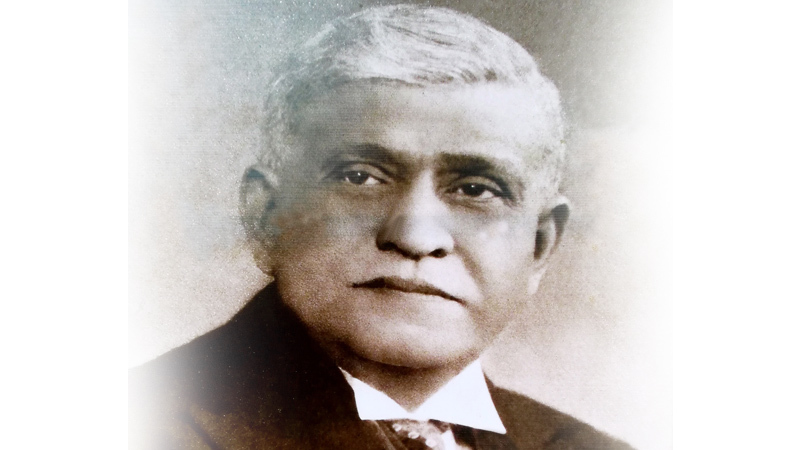 The success story at Dharmaraja College brought him to Colombo to be appointment as Vice Principal of Ananda College in 1898 and soon thereafter as Principal in 1900. His determination to raise funds for the school saw him travel all over the country by rail, coach, cart and sometimes by foot. His self-sacrificing nature to a bigger purpose, to a bigger cause always got the better off him. This led him to become a national figure from a household name. His appointment as the Secretary of the Buddhist Theosophical Society in 1908 gave him the necessary impetus to advance Buddhist education to even greater heights. He was passionate about advancement of education in the country in general and Buddhist education in particular. Sir D.B not only carved himself out as an educationist but also as a scholar. The speech he made on Buddhism at the Congress of Religions in Berlin in 1910, which was given wide publicity in Germany, made him a scholar of international repute. He also edited numerous texts which were used in schools, universities and places of higher learning. He was the founding Chief Editor of 'A Dictionary of the Sinhalese Language’. These publications will keep his memory ever green among succeeding generations of students. Through scholarly speeches made being an active member in Temperance Movement, carved him out as an intellectual beyond his times. Sir D.B though an educationist at heart, was thrown to the deep end of politics when he got involved in the nationalist movement against the colonial rule. It is claimed that he once remarked that “there is no greater danger to a country than an ignorant democracy”. His greatest contribution to politics was that he humanized politics with scholarship and religion. He rose above pettiness of class, race or creed. He won the love and support of every community in the island because he was preeminently a man of the people. His political career commenced when he decided to fight the cause of innocent prisoners who were arbitrarily arrested. Sir. D.B himself was arrested in June 1915, allegedly for making seditious speeches and writing inflammatory articles. Others such as D.S. Senanayake, F.R. Senanayake were all taken in as prisoners. Soon thereafter on May 28, 1915 the Sinhala-Muslim riots broke out and Martial law was declared in the island. Although born to be an educationist and religious and social worker, his determination and voice to get justice for the riot prisoners made him a politician and freedom fighter overnight. Sir D.B in his moments of highest political attainment, in the hour of his greatest glory, did not forget the people from whom he came. This is the secret of him not becoming a ‘lost leader’. Sir D.B started a reform movement with fellow activist, such as F.R Senanayake, E.W. Perera and Sir Ponnambalam Ramanadhan. When the National Congress was formed in Ceylon, he became its representative in England. Upon his return to the island in 1919, at a grand reception held for him at Ananda College to welcome him (much to his displeasure for he did not like pomp and pageantry) he has declared thus; “I have decided not to have receptions and precessions. I believe in giving my best to my motherland without expectation of any praise or demonstration of any kind. I believe in humility and simplicity. I believe in being one with the common man”. Words of wisdom for the rulers of today! On December 2, 1923 he was elected the President of the Ceylon National Congress. When elections were held under adult franchise for the first time in Ceylon in 1931, Sir D.B was elected Member of Parliament for Kelaniya. He then became the leader of the House of the State Council of Ceylon and Minister of Home Affairs. Sir D.B was Knighted by the British Government for his immense service rendered. When he retired from active politics in the eyar 1942, his strong relations with India made him the ideal candidate to be appointed as Ambassador to India. He was appointed at a time when relation between India and Ceylon was at its lowest ebb, over the problem of Indian migrant workers in our tea estates. The philosopher statesman that he was, Sir D.B was able to smoothly handle the situation and maintain the cordial relationship with India. During his mission in India, Sir D.B’s health was failing, first by a malaria attack and then by other complications and it was his ardent wish that he return home for treatment. On May 29, 1944 he was flown home in a special plane organised by the Viceroy of India. On his way back to his beloved home country, it is said that he suffered a heart attack and passed away in the plane whilst still over Indian territory. His remains were cremated at Borella amidst huge crowds on June 1, 1944. Sir D.B died bequeathing unto the Public Trustee upon his Last Will his valuable home, the house and property called the ‘Thurburn House’ at Bullers Road, Colombo 7. Today it house the Public Trustees Office. His trust in the public service system was unquestionable for he left his most prized and valuable asset to the care and custody of the Public Trustee. A duty that is bestowed on anyone holding the office of ‘Public Trustee’ is to ensure that the property left behind by this magnanimous statesman, be persevered and his wishes be carried out. This is the least this country can do to one of her greatest sons. Ceylon lost its most ‘uncommon common man’ as he was once described. With his death Ceylon became much poorer. But then again great men never die. He was a philosopher king, the like of which we have not had in this country from then to this day. In the words of D.S. Senanayake, Sir D.B “had the courage of his convictions, it was not popularity that he sought, but that he should act in the way which he thought was the best interest of the country … personal considerations never weighted for him. The interest of the country was all that he was concerned with”. My humble wish is that, may the likes of Sir D.B be born amongst us and may this nation once again have a philosopher king.